The Climate Forum hit a high with a positive effervescence of multi-faceted perspectives on the climate crisis. 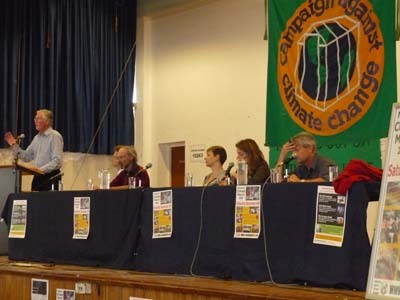 "Positivity" and "Negativity" battled it out on Saturday's major plenary with contributions from Michael Meacher MP, Caroline Lucas MEP, Tony Juniper (Director, Friends of the Earth), Isabel Fremaux from the Climate Camp and the Campaign's own Phil Thornhill . The Sunday 'International Plenary', meanwhile, exposed the audience to some perhaps less familiar perspectives from around the world - with Bangladesh, Nigeria, Belgium, Taiwan, Spain, Senegal and the Phillipines all represented on the panel. Workshops (50+!) as ever covered a multiplicity of themes but some very constructive, no-nonsense, discussion was had on major campaigning themes like Heathrow/Aviation and Kingsorth/New Coal. In particular John Macdonnel MP was able to offer a detailed and up to date analysyis of where the Heathrow campaign now stood - to those who made it to the early sunday morning seminar! The Forum benefited greatly from its new less formal venue to create a very special special atmosphere of convivial creativity and down-to earth dialogue. A play reading, artistic installations and - on the Sunday - music from the Carbon Town Crier all livened up the more serious proceedings of debates and discussions. 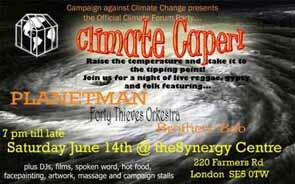 The Saturday Night Party - down in the Synergy Centre, Sarf o' the river - went with a swing whilst proceedings were rounded off on Sunday with some hands-on campaigning as forum-goers migrated en masse to the anti-Bush demo in Parliament Square, bringing with them the climate issue - which now became a part of the demonstration manifested through campaign placards and even more conspicuous symbols like our seven foot square 'globe-in-a-greenhouse' and 15 foot high "Bush Wanted for Crimes against the Planet" banner, which was hung from a convenient tree! Climate Justice / Ecosocialism / Climate Science: what are they saying now ? / Carbon Trading: a false solution / Climate change and conflict / Direct Action / Food: can we save the world by changing the way we eat? / Population Control: the way to cool the climate ?/ Contraction & Convergence or Cap & Share: the ecological economics underpinning future climate solutions / Energy & Anarchy: the need to escape from market-based thinking / Youth and climate change: campaigning for our future! / Transport: fastest growing source of UK GHG emissions / Banking, Economics and Climate Change / Small businesses and our environment / Low carbon-cities, or low impact councils? / Climate change and faith / Is capitalism wrecking our planet? Workshops on climate for 12-18 year olds and child friendly activities for younger persons: see the Kids' programme (attached below). Entry - recommended donation of £5 for 1 day, £8 for 2 days.